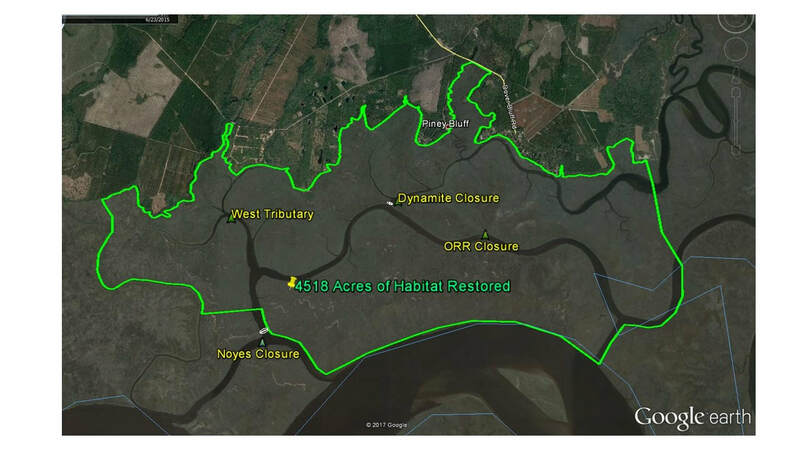 On Dec. 8, 2017, US Army Corps of Engineers (USACE) released draft plan to restore a portion of the Satilla River estuary by closing man-made cuts that have degraded the ecosystem by altering the natural hydrology. 2) restoring a normal saltwater gradient that fish and shellfish use to locate the upper reaches of creeks. The proposed modification to the estuary consists of closing Noyes Cut, Dynamite Cut, and a highly constricted old creek channel (noted by ORR on the map below) that connects Umbrella Creek south to Dover Creek. •improved habitat for local and migratory species including shrimp, blue crabs, striped bass, American shad, river herrings, seatrout, and red drum. •improved small boat navigation in areas of Dover Creek and Umbrella Creek that have experienced increasing sedimentation and restricted access over the past century. Read more in Satilla Riverkeeper's Press Release. A Public Engagement Meeting was hosted by US Army Corps of Engineers, Coastal Resources Division of GA DNR, and Satilla Riverkeeper was held January 19, to discuss the Draft Feasibility Study Report. We expect the final Feasibility Study Report to be released by the end of 2018. The full report can be downloaded by clicking on the title “Draft Environmental Assessment and Finding of No Significant Impact, Noyes Cut” at the Plans and Reports website of the Savannah District.